I arrived at Sydney’s Conservatorium of Music at about 7:15pm where there was a queue outside of people who were buying ‘at the door’ tickets. There was nothing much to do, seeing that I preordered my ticket nearly a month prior to the event, so I made my way inside Verbrugghen Hall and located my seat. The hall was lovely — very old but modern in a sense — and started packing up fast. The instrumental setup was already on-stage. There was a mass amount of percussion gear, though I figured the role would be pretty demanding and needing of all the stuff. The show didn’t start till about 15 minutes overtime due to, as mentioned before, the long line of people lining up. When the show started, the MC came onstage and announced the musicians, where they performed their first piece. The “Digimon Arrangement” was a composition by Hitoshi Sakimoto from the game Digimon Savers: Another Mission, and was specially arranged for the concert by Sakimoto. It was particularly bouncy theme, which made vibrant use of all instruments. Natalia Raspopova, who was the pianist, demonstrated her talent by performing hard arpeggios and scales. It was a somewhat obscure choice from a quietly released title, but it makes me want to check out the game just for the music. Following this, the MC came back to introduce the composers, walking on to the music “Victory” fromFinal Fantasy XII. Yasunori Mitsuda and Hitoshi Sakimoto came onstage, Mitsuda with his bouzouki with semi-casual gear, and Sakimoto wearing a semi-formal suit. Mitsuda first said something in Japanese to the audience before the MC read out the English version of his speech. In summary, he thanked the musicians and the audience. Then, Sakimoto approached the microphone and spoke in English, saying, basically, a similar speech. The audience clapped and Sakimoto made his way down the isle and sat and watched with the audience. Mitsuda stayed onstage, where the MC came out and announced that he will play the bouzouki in the next piece. All those familiar with the original version of “Is Kirite Burning Up?” with the vocalist Eri Kawai will surely notice that her voice is replaced by Hiroaki Yura and Ayako Ishikawa’s violins. Jy-Perry Banks, brother of the guitarist, Zane Banks, was a special ‘last minute’ guest bassist for the evening and played exceptionally well with his brother, who played the electric guitar. Mitsuda didn’t do any bouzouki solos, simply rhythmic material, but he added additional texture to the piece. About mid-way through the track, Zane cranked up an improvised guitar solo which was amazing! All in all, a fantastic piece. Mitsuda then left the stage, and concert resumed. Xensoaga Episode II‘s “Sakura” did nothing too special with the arrangement here except for the minor melodic changes. This time it was just the violins and the piano. It was short and sweet, but the harmony with the second violin in the piece’s peak was definitely welcomed. The MC then came back to introduce the next three pieces. 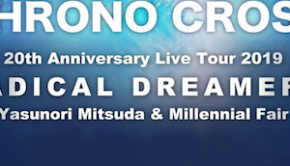 Fans of Chrono Cross recognised “On the Beach of Dreams ~ Another World” in an instant. The performance itself was like a live version of the original. The violins played the melody, as like the original, with the piano provided ostinato backup. The guitar was used exceptionally well too, and my only criticism here is that it was too short. Final Fantasy XII‘s “Clan Headquarters” was one of the best pieces performed, thanks to the awesomeness of the original theme by Hitoshi Sakimoto. The melody was magnificent though it sounded slightly watered down with only two violins opposed to the synth string ensemble. I’m just amazed at the talent of the performers to be able to keep up with such a difficult choice. As for Xenosaga Episode I‘s “Pain”, people who have heard the soundtrack will realize that this piece is no different to the Piano version of the track. Still, a lovely performance. 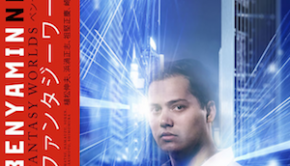 The next two tracks were from KiRite, Yasunori Mitsuda’s solo album. “Promise with Winds ~ Petal’s Whereabouts” was another brilliantly performed track, which rivaled the original recording. Again, Kawai’s voice is replaced by a violin. The result sounds a lot smoother and more subtle, but the change is good. “Nocturne” stuck more closely to the original. There were only two instruments, again violin and piano. The piano started off playing the original prelude before moving into the main section, which Natalia then performed a bit faster than should be, making the Hiroaki Yura and Ayako Ishikawa catch up. Nothing major, but those picky about mistakes like myself would pick it up. Ayako performed the next track alone with Natalia. I had never heard of Jacob Gade’s classical piece “Tango Jalousie” before, but the melody was strangely familiar. All I can say is that it was well performed. The MC then announced the last four tracks before the interval, being a mixture of themes from games, animes and movies. “Penelo’s Theme” was one of the only character themes from the Final Fantasy XII and this track was performed with a minimalist touch. The two violins played the familiar melody and newly added guitar transformed the track so it sounded more familiar or cozy. I liked it, though I felt the original had more depth and meaning to it. .hack//Liminality‘s “Mai” was a theme I had not heard before simply because I limit myself from listening to too much Kajiura as I’m not a huge fan. It was very nice actually, and made excellent use of all instruments onstage. There was a purposely cacophonic part in the middle, which I thought was a mistake originally. Quite good overall. The Super Mario Bros. medley seems to be a traditional track performed at every Eminence concert, though they arrange it differently every time. This time, before the piece, the performers went offstage for about a minute, leaving the audience wondering what was happening. Then, they came out wearing Santa Claus hats. The audience started laughing and then the piece commenced. The theme had all the prominent Mario themes, including, obviously, the Main Theme, the Underground Theme, Starman and more. “Whole New World” was the last track from the first half. It’s the popular theme from the Disney film, Aladdin. The piano part kept close to the original score, but the rest was refreshingly new. Not much to comment about here, other than you’d like this version if you’re a fan of the original. It was now the interval and the audience had the chance to get up and buy merchandise from the foyer outside. The MC also announced that people could win a copy of the Final Fantasy XII Original Soundtrack if they filled out surveys. Surprisingly, MANY people did. There was some of Mitsuda’s CDs available for sale, including An Cinniuint, Hako no Niwa, Moonlit Shadow, Kirite, Sailing to the World, Sailing to the World Piano Score, and Chrono Cross Guitar Arrange. Since I didn’t have Sailing to the World Piano Score, Hako no Niwa, Sailing to the World, or Moonlit Shadow, I decided to buy them, which totaled my Mitsuda CD collection to an even 15 CDs and one score book. You could also see Mitsuda’s assistant and Procyon Studio manager Yoshie Miyajima supervising her merchandise. The interval was about 15 minutes long before the bell rang and it was time to go back inside. Again, the MC came out to announce the next two pieces. Now, I’ve never seen Haibane Renmei and I’m not familiar with Yoshitoshi Abe, but I do like Ko Otani and I do consider myself a fan of his. “Free Bird” was exceptional. An ideal combination of piano, violin, percussion, and guitar that awakens a sort of warm feeling. Hitoshi Sakimoto’s vocal album, Colors of Life, marked his first major release away from video game music. “Ferris Wheel” was one of the best pieces on the album, not because of Lia’s vocals, but for the dramatic epic piano accompaniment. That didn’t change from original piece, but Lia’s voice was well replaced by the two violins that provided an enchanting sound. I had not heard of next piece but it was again a reasonably popular folk tune, Johanne Brahmes’ “Hungarian Dance”. Ayako performed this catchy piece with Natalia on piano. Following was a piece I had been dying to hear performed live. Hitoshi Sakimoto’s “Ending” from Legaia Duel Saga is in my opinion one of his best compositions. From the emotional “Paying the Worthless War” to the dramatic finale, this track has everything. I was expecting a superb arrangement to be performed, and my wish and expectation was thankfully fulfilled. This is one of the main reasons that I attended the concert, and the piano by itself justifies it. Natalia does extremely well to live up to the original, with all string parts being played by both violins. Excellent. I was a bit skeptical about howChrono Cross‘ “Radical Dreamers” would turn out, but other than a few mistakes from the guitar in the introduction, it was played flawlessly. Noriko Mitose’s soft, child-like voice is matched by the mature sound of the violin. The ending of the track, as with the original, is tremendous. There’s not a lot more I can say about it. It’s that good. “Sunlight Earth” was another piece from Kow Otani, this time fromShadow of the Colossus. It was a piano solo, but it was performed a little too fast. Other than that, it was quite enjoyable. Again, the MC came out to introduce the next few tracks. “When You Wish Upon a Star” came from another Disney film, Pinocchio, and it was again only Ayako and Natalia on stage. They portrayed a dreamy effect which you could doze off to while keeping the traditional melody. As for Saint-Saens’ “Dance Macabre”, I had never heard of the title before, but I had heard the piece many times. Again, the two performers stayed onstage to perform this, and it was quite enjoyable to hear live. After this, the MC came back onstage to say that if anyone had any additional surveys they needed to fill out, they should hand them to the ushers in the aisle for collection. They would draw the winning survey at the end of the show, with that person winning a Final Fantasy XII soundtrack. Because I was filling out a survey at the time, I couldn’t remember Joe Hisaishi’s solo work “Two of Us” too well. Too bad. The MC then came out for the last time before the show’s end to thank the sponsors and such. He also announced that Mitsuda would come back on stage to perform on the bouzouki for Chrono Cross‘ “Time’s Scar”. 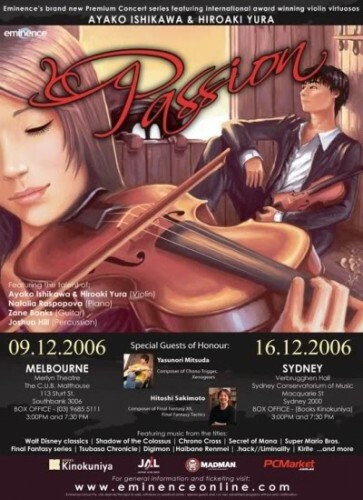 However, after he left the stage, Hiroaki started talking about next year’s A Night in Fantasia 2007, which is Eminence’s trademark event. He said that it will be split into two events, one known as A Night in Fantasia – Symphonic Games Edition and the other known as A Night in Fantasia – Symphonic Anime Edition. He said that both concerts would play solely the video game pieces and anime pieces from a huge amount of games. 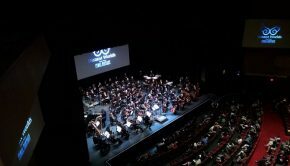 He also said that six guests would be coming to the Symphonic Games Edition, including Jason Hayes, Junichi Nakatsuru (Bandai Namco), Masaru Shiina (Bandai Namco), Yoko Shimomura, Yasunori Mitsuda, and Hitoshi Sakimoto. It certainly made me want to go to the event already! After, the musicians came back onstage with Mitsuda to perform “Time’s Scar”. Before the piece began, the musicians put on sunglasses, including Mitsuda, to which the audience laughed. 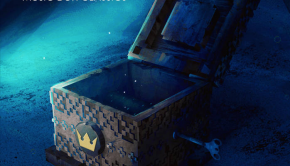 But all jokes aside, this piece was amazing. It stuck very closely to the version on the original soundtrack, but you could hear the main differences, including a more prominent piano role. The violinists played very hard to keep up with the pace, and Joshua Hill put on an extremely awesome drum beat to maintain the tempo. Mitsuda definitely would have been proud to hear such a great performance of one of his most prized themes. “A Song of Storm and Fire” was yet another Yuki Kajiura piece, but I really enjoyed this one. Not due to melody, but the incredible percussion. Very apocalyptic sounding and a definite a foot tapper. A great way to finish off the program. After that piece, the audience took a bow and went off stage and then came back on again for a final bow. The MC came on stage with two copies of the Final Fantasy XII soundtrack and announced that due to the amount of surveys they received, they would draw two winners. He called Sakimoto to come back to the stage to draw the winners. The first winner was a teenager who was called to the stage to claim his prize and shake the hand of Sakimoto. He asked him if he could hug him, and did so, the audience immediately laughing. The second winner was a middle-aged man, to which the audience laughed again, as he came onstage. After that, both the MC and Sakimoto left the stage. Hiroaki then asked the audience if anyone liked Secret of Mana, with a few shouting back, “YES!” This followed on to the encore piece. For those that don’t know, “Meridian Dance” is the final battle to the game Secret of Mana (aka Seiken Densetsu 2). Now, this was an awesome piece. The violin parts were insanely fast and the percussionist pumped and pounded his instrument. But the best part no doubt was the bass. It was so catchy and, well, awesome. So very awesome. The audience cheered and wowed at the performers onstage. Hiroaki then called Mitsuda back to the stage to perform another encore piece, this time “Time’s Scar” again without the sunglasses! After the show, everybody had the chance to meet and greet with the guest composers and the musicians. The line was very long, so I waited till it became a little shorter for my turn. In the end, I came to Passion hoping to get a great night out of it, and what I received was an outstanding performance. Posted on December 20, 2006 by Harry Simons. Last modified on March 1, 2014.